10 ways we can all work together to share the road. One good deed leads to another. Research shows that 85% of Queenslanders agree we should all be more tolerant on the road. Well, as this campaign shows, it can all start with one good deed. The “Thanks Queensland” movement is all about celebrating courteous drivers. It's a thank-you wave on a statewide scale. It's a nod to all the safe road users on two wheels, four wheels and more wheels. Because no matter how we get around, we all need to get along. Check out the videos below. Remember that if you can’t see the truck’s mirrors, they probably can’t see you. Be aware of the main blind spots for cars. 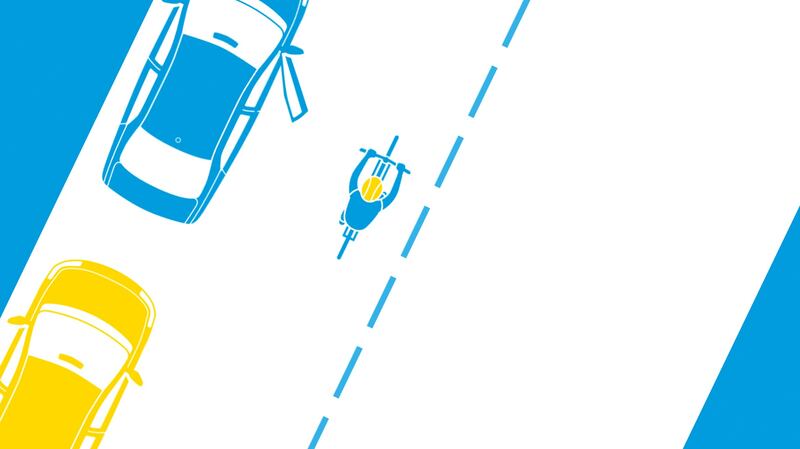 If you are riding, move out of blind spots as soon as possible. If you’re driving, look over your shoulder to see who’s there before you turn. Always check for cyclists before you open your door. Trucks take longer to stop. When overtaking trucks, leave plenty of space for them to brake. Long trucks are allowed to use more than one lane to turn, so give them lots of room. Don’t be distracted, watch for signals and stop when the lights are flashing. Ride to be visible so you and your motorcycle can be seen. Look out for motorcycles, especially when the roads are wet. Watch “Share the road” on YouTube. So thanks Tom for letting that mum in. Good onya mister weekend lycra for letting everyone know that you were going to make that turn. A big thumbs-up to all you truckies for not tail-gating the little fellers. Thank you everyone who believes in showing a little thought for your fellow road users. For giving the big boys room to turn. For making sure you’re tuned in to your surroundings. Thanks for helping make our roads a happier, safer place. Keep it up Queensland because one good deed leads to another. Watch “One good deed” on YouTube. So thanks to Cadell and Evan for knowing that even though you are allowed to ride two abreast, sometimes it’s nice to switch to single file in a skinny street. And thanks Sam, for not dipping around until you know you can stay wider of the rider. Thank you both for helping make our roads a happier, safer place. Visit Join the Drive To Save Lives to see how we can all share the road. Watch “Thanks cyclists” on YouTube. Just a bit of courtesy can be contagious. So thanks John, for recognising that gap in front of that truck isn’t a gap, it’s the breaking distance. And thanks Barbara for leaving plenty of room to brake safely. Thank you both for helping make our roads a happier, safer place. Watch “Thanks truckies” on YouTube. So thanks Martha for looking over your shoulder and in your side mirrors before changing lanes. And thanks Easy Rider for knowing that it’s a lot easier riding when you move out of those blind spots. Thank you everyone for helping make our roads a happier, safer place. Watch “Thanks motorcyclists” on YouTube. One little thing you do can make a big difference. So, thanks Nick for making sure you’re tuned into your surroundings. And thanks Lucy for making sure you can hear all the important stuff, like the traffic around you, sirens and even the moment when your heart skips a beat. Thank you both for helping make our roads a happier, safer place. Watch “Thanks pedestrians” on YouTube.